Hammerworks Traditional Copper Wall Lantern WM112 offers a classic appearance with simple lines. First of all, this historic wall light adds an elegant statement to any setting. Furthermore, while a single hurricane globe is standard, you can upgrade to a 2, 3 or 4 candle cluster. This option adds a graceful appearance to these time-honored outdoor wall lanterns. Another important factor, you can also choose from solid copper, brass, verdigris or painted black finish options. For your convenience, we also offer a complete selection of matching Colonial Post Lanterns and Colonial Hanging Lights. Therefore, it is easy to mix & match your traditional outdoor lighting fixtures. More importantly, since each outdoor light fixture is handcrafted out of solid copper or brass, the result is a high quality lantern. This ensures that you will receive a durable light to endure throughout the years to come. Especially relevant, as mentioned, we offer several coordinating Handcrafted Traditional Post Lights. 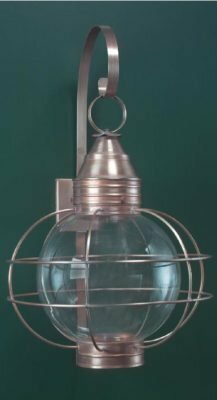 Most notably, Colonial Post Lantern Small Sturbridge P102 or Colonial New England Style Copper Post Lantern Large Sturbridge P101 are among the most popular. Furthermore, choose from two sizes of the iconic reproduction Colonial Boston Post Lantern P103. No matter which model post light you choose, keep in mind the factors of size and quantity. First of all, don’t hesitate when it comes to the size. Your post lantern may appear too small if not scaled correctly within the setting. Consequently, the distance from the post light to the building, along with the building size itself determine the size of the light. Also, depending on the length of the driveway or walkway, more than one fixture may be necessary. Above all, our traditional outdoor wall, post & hanging lanterns work together to create a unified & pleasing appearance for your home.